Adobe's Photoshop Touch app for iPad 2 that launched Monday not only allows you to grab images from your camera roll, but you also can paint special effects onto images and add your own text. The $9.99 app has core features found in the desktop version of the software, as well as tablet-specific capabilities such as Facebook and Google Image Search integration and cloud image storage. 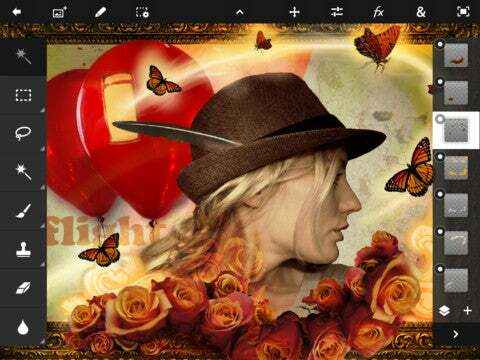 Adobe's Photoshop Touch app for iPad 2 joins the company's suite of iOS apps Color Lava, Eazel and Nav, among others. The Photoshop Touch iPad app was previewed by Adobe last year, and Android users had some five months to play with their version of the app. Now it's time for iPad 2 users to have a go, but original iPad owners seem to be out of luck due to the tablet's single-core processor. The iPad version of Adobe Photoshop Touch goes further in functionality compared to the pretty basic (and free) Photoshop Express app. Photoshop Touch can combine multiple photos into layered images, and you can use selection tools, adjustments and filters to create your artwork. The Scribble Select feature makes it easy to select and remove elements of an image. The new app has popular Photoshop effects and filters, but you also can paint special effects onto your images with filter brushes. Once you are done creating your masterwork, you can email or share on social networks your image, or upload it to Adobe Creative Cloud, from where you can download it and open it as a layered file in Photoshop CS5 on your computer. Just note that the output file will only be of 1,600 by 1,600 pixels resolution, which should be enough for a medium-sized printout. A few new iPad apps are coming up soon, Adobe said, including Collage for moodboards, Debut for presenting and reviewing creative work, Ideas for sketching, Kuler for exploring color themes, and Proto for website and mobile app prototyping.